Celebrations for the 20th year of the Honda Collection Hall event were held at the south course of Twin Ring Motegi on 16th July 2018. To commemorate the occasion there was a special show run of bikes. In total 34 two-wheeled Honda bikes and 29 four-wheeled Honda machines from the company’s very beginnings up until the present day were demonstrated. After the 1947 Model A, the prototype Model B (1948), to the Model C (1949) that had an in-house manufactured engine and bicycle frame for the first time, next in line came the Dream Model D that appeared in August 1949. Nowadays we have become used to hearing such keywords as the company slogan “The Power of Dreams” and the motorbike sales shop network “Honda Dream” that symbolise Honda, yet there are no records remaining regarding the “Dream” naming. At the time Soichiro Honda exclaimed various dreamlike theories such as “The world will become Honda’s before long!”, and when his employees had examined the first experiment model he unintentionally blurted out, “It’s like a dream” and that they should “entrust the dream” with this model for the future. 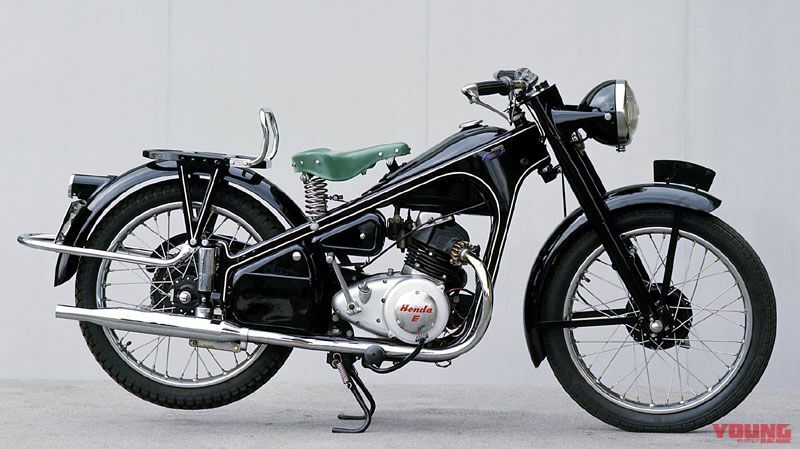 Honda made a start as a serious bike maker with the Dream series in the era around 1950. 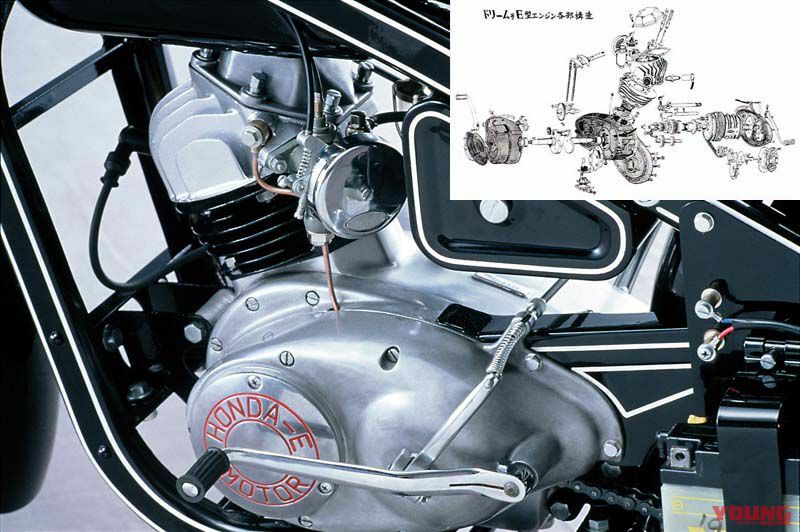 The body of the Model C was an in-house manufactured Honda, but because the base was a bicycle frame it was not possible to meet the demands safely for any more power output. Honda was reaching its limit with things like ride quality, durability, and braking performance. Therefore, an engine and frame was developed in-house for what would become the Model D. The newly-adopted channel-frame which was made of high-grade copper had telescopic suspension at the front, remaining rigid at the rear. (Honda Dream Model D August 1949) The predecessor of the Model E, the Model D was the first serious bike with the engine and frame being produced in-house. It had an evolved version of the same Model A two-stroke engine, but the body did not have the appearance of an engine assisted bicycle. The cone clutch two-speed system was clutchless and would later be passed on to the Super Cub. Sales of the Dream Model D were unfavourable, so production ended when the Model E was released in October 1951. The Model D was sold at a time when the Japanese government had adopted a deflationary policy, which contributed to the great depression in Japan. From this time on the Japanese market trends had changed as four-stroke bikes became a more popular choice. In addition, concerns were raised about the peculiar cone clutch mechanism. 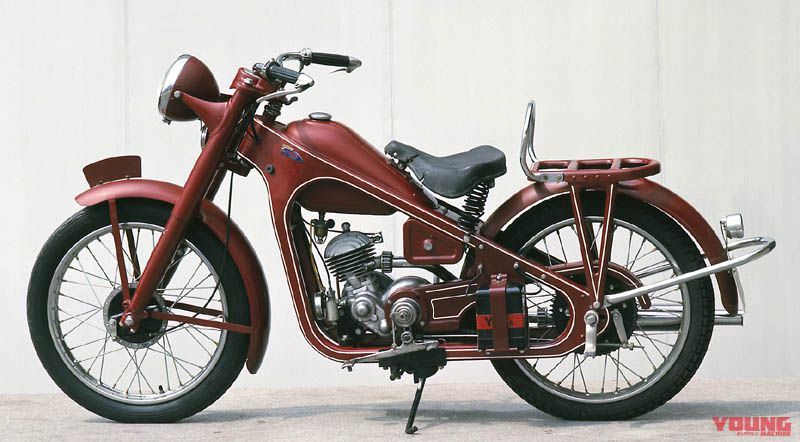 The Model D was the first Japanese bike to have a semi-automatic clutch mechanism, and there was no need to operate the clutch for changing gears. If you pressed your left foot on the front of the shift pedal it would go into first gear, then by releasing your foot it would return to neutral, and if you pressed the rear of the pedal with your heel it would go into second gear. However, this meant that when climbing a hill in first gear you would have to keep pressing the tips of your toes on the pedal the entire time, so it appears this is what affected the bike’s sales. Development of its successor, the Dream Model E, began in March 1951 and this became the first Honda machine to be equipped with a four-stroke engine. The anecdote remains of how four months later in July it was being tested non-stop around a mountainous region of Japan, Hakone. 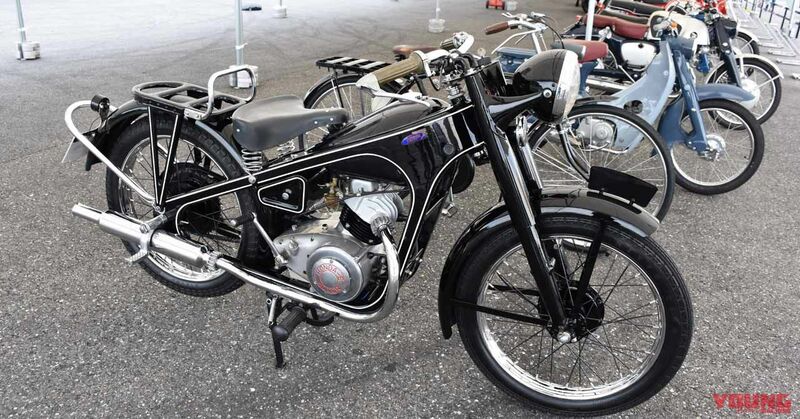 The Dream Model E four-stroke OHV engine was 146cc/5.5bhp, and came at a time when it was said that a 1000cc four-stroke bike engine would corresponded to 20-30bhp, so it greatly exceeded this level by producing the equivalent of 38bhp. A surge of sales shot it up to the top of its class overnight. Based on the fact that the Model E used the same channel-frame as the Model D there was the tendency to view it as a mere model change. However, this had become an opportunity for Honda to change over to being a four-stroke maker, so its introduction had greater significance than just that. In addition, the Model E series played a great part in the evolution of engineering at Honda, and helped in accomplishing their large business scale. This is the single-cylinder OHV Model E engine with the intake exhaust valve positioned horizontally. The aluminium crankcase covering the left and right-hand side that houses the clutch and transmission was finished neatly, and the exterior cast aluminium cover looked stylish. New style CB1300 (SP) with Ohlins & Brembo on its way?! Will the next three-wheeler be a Tricity 250?